Welcome to How to Cook Something, the feature where a I make a recipe from my favorite beginner's cookbook, How to Cook Everything by Mark Bittman in an effort to learn my way around the kitchen. This is now a once-in-a-while feature rather than a weekly one... I needed some variety! You can find past How to Cook Something posts here. When we traveled to the East Coast over Memorial Day weekend, we had the pleasure of dining at Lansky's, NYC's newest (and best) deli, with some of our favorite family and friends. Two of my uncles are partners in the restaurant, and one of them, my charming 90-years-young great uncle Robert, greets every guest at the door. Pardon my slight bias when I tell you that it was the most delicious deli meal ever! If my family connections discredit me, see our [totally unrelated] friend Erin's post about our meal at Lansky's. 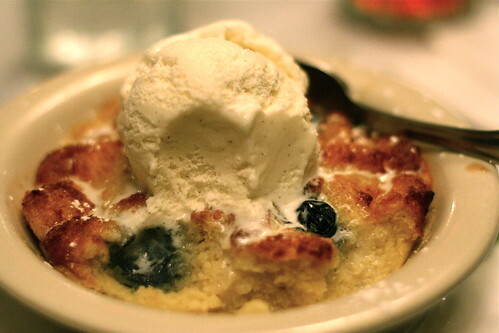 My favorite part of the meal (even more than the pickles, which is saying a lot) was the white chocolate blueberry bread pudding with vanilla ice cream. I haven't been able to stop thinking about it. Despite its stigma, I love white chocolate, often even choosing it over milk or dark. And, well, you know me and berries. I found myself earlier this week with almost an entire loaf of white bread (I only used 3 slices in the white gazpacho) and almost an entire carton of eggs about to expire. It was a mandate to make bread pudding. After poring through dozens of recipes, including some great recommendations from twitter friends, I decided to go with my old friend Bittman. Obviously. I modified his recipe just a bit to account for my white chocolate blueberry craving. Wanna know how it turned out? I am on cloud nine (aka sugar-induced food coma, aka my happy place) right now because my version is the doppelganger of the Lansky's version. Thanks, Mr. Bittman! 1/2 c. sugar plus 1 tbsp. 1. Preheat oven to 350. Over low heat in a medium saucepan, warm the milk, butter, cinnamon, 1/2 cup sugar, and salt, just until the butter melts. Meanwhile, butter a 1 1/2 quart or 8-inch square baking dish, and cut or tear the bread into bite-sized pieces; they need not be too small. 2. Place the bread in the baking dish and pour the hot milk mixture over it. Let it sit for a few minutes, occasionally submerging any pieces of bread that rise to the top. Beat the eggs briefly and stir them into the bread mixture. Sprinkle blueberries and white chocolate chips on the mixture and gently stir until well distributed. Sprinkle remaining tbsp. of sugar over the top. Set the baking dish in a larger baking pan and pour hot water in, to within about an inch of the top of the dish. 3. Bake 45 minutes to 1 hour, or until a thin-bladed knife inserted in the center comes out clean, or nearly so; the center should be just a little wobbly. Run under the broiler for 30 seconds if you like, to brown the top a bit. Serve warm or cold, with or without whipped cream or ice cream. This keeps well for 2 days or more, covered and refrigerated. OMG this looks AMAZING and I want to make it ASAP!! WOW, looks so incredibly delicious. And welcome to CEiMB....its a really fun group with great people. I just joined a few weeks back and I am so happy I did! Everyone has been so welcoming! Berries, white chocolate, and scads of bread, eggs and milk? What's not to love!? I'm so happy it turned out well---and just imagine all the variations you can play around with now! Oh man. I am so gonna make this. Wow. 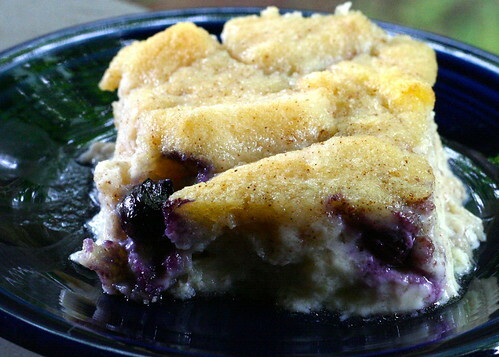 Ry loves bread pudding and I am a sucker for blueberries in anything so yea, definitely gonna make this one. Thank you so much for posting it, and making it. It looks sooooo yummy. You're pictures are fantastic!!!! The bread pudding came out just OK. I dont know if I did something wrong? There were several chunks of cooked egg throughout the bread pudding. I'm assuming that maybe I didn't stir it up enough. Any thoughts on how to perfect this? Anonymous: Sorry to hear that it wasn't your favorite. I'm not an expert, but my suggestion would be, as you said, to stir it up more next time, make sure the eggs are well-beaten and well-distributed.